These are profound and intense words of wisdom, unbelievably, from The Greek Iron Age - a period of time between the collapse of the Mycenaean civilisation around 1100 BC and the beginning of the Greek Archaic Period of 800 BC. 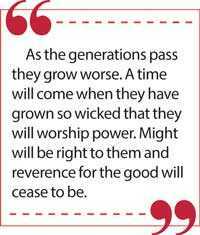 These are ancient words of wisdom that stand true even today. In this article, we take the opportunity to present to you the two main types of “classes” – the political class and the commoner class – for your consideration and contemplation. 1. The political class – They are the so-called elitists, connected, crony government pals and corrupt corporate insiders who run the criminal government cartels. 2. The commoner class. That’s you and I and all the taxpayers, wage earners, unemployed citizens and everyone else who isn’t part of the “elite”. Take a look at all the fundamental freedoms the people once enjoyed – freedom to choose, freedom to own a piece of land free and clear, freedom to say no to corruption and bribery, freedom to engage in cash transactions, freedom to travel on public roads, and even freedom to express yourselves. Each of these freedoms is being systematically destroyed by a deliberate campaign of usurpation by the political class. The goal is to concentrate all power into the political class by denying any real freedoms to the commoner class. The action we all need to take is to vote against the political class at every level of elections, whether it be national or provincial. Reject any idea of voting for or against a particular party. Instead, vote out the corrupt establishment insiders, the likes of cruel, tyrannical and oppressive rulers, and vote in, those who are more likely to shake up the power structure at every level. Only by rejecting the political class – and ultimately making them obsolete – can we restore power where it rightfully belongs: in the hands of the commoners. The entire aim of the political class is to control, enslave and exploit the commoner class while maintaining their own power and corruption. In order to do this, the political class must strip away all the fundamental freedoms that man enjoyed. If we fail to stop the agendas of the political class, you will see the rise of a totalitarian society characterised by a government in which the political authority exercises absolute and centralised control, crushing all autonomous institutions in its drive to seize the human soul. If you are planning on voting for those who have this tendency to bend the truth, it is an undeniable fact which, actually puts such people on the same psychopathic spectrum as many of the killers and murderers in the political arena; and without any doubt you are going to get the tyranny you deserve - and you will soon wake up one day and find yourself living in a totalitarian police state that claims total ownership over your body, your mind, your wealth and property as well as your entire existence. If we do not stop the march of totalitarianism of the political class, we will lose all our freedoms. If we do not defeat the corrupt political class that now seeks absolute rule over our beloved country - Sri Lanka, we will soon discover ourselves to be enemies and slaves in our own nation. This is why, if you believe in the freedom to choose you have a moral obligation to vote against the corrupt, dishonest and immoral political establishment at the next elections. Let your voice be heard in the safety of the voting booth. You can secretly vote for any politician or party of your choice; but it must be ingrained in the heart and minds of everyone that politics matters! The outcome of the forthcoming elections will determine the direction of Sri Lanka, for generations to come. We will either march down the road of totalitarianism and deep corruption (MaRa-Sira combine), or we have a chance to overthrow the political class and start the hard work of taking back our country on the correct path of decency, conforming to standards of propriety and morality. You must be alert to the hate-creating stories which are copiously supplied by politicians when such actions help to discredit their opponents. Hatred is fostered with stories of crimes of a group that is distinct from one’s own and so usually an object of hostility or dislike; but the impact of these stories comes from repetition – not truth. Hatred relies on people accepting, rather than investigating, hate-creating stories. Hatred declines when there is private incentive to learn the truth. This framework is used to illuminate the evolution and surge of episodes of anti-religious propaganda. Much of human misery and despair perpetrated by the criminal vermin in our country, is due to religious and ethnic conflict. Memes – images, videos, pieces of text, etc., typically humorous in nature – are copied and spread rapidly by Internet users, often with slight variations - might seem trite, to those unfamiliar with them; but they can be an efficient way to spread disinformation and conspiracy theories in a viral, insidious way. The subsequent spread of misinformation contained in memes can have serious, even violent consequences. 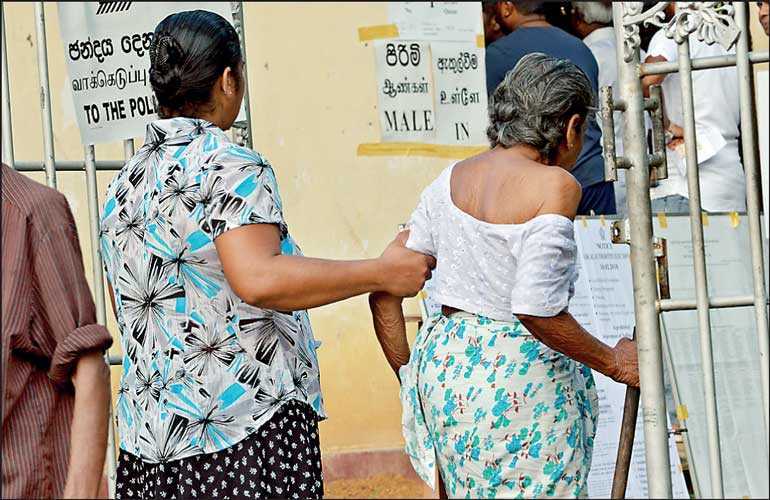 If you care about your family, your health, your freedom of choice and your right to live a self-reliant lifestyle, the next elections may be your very last chance to halt the march of tyranny across Sri Lanka. So, pull up your socks and start working harder, because you cannot afford to be lazy or careless any more. Even if you usually don’t vote, it is exigent that you need to drag yourself out to a local voting centre, at the next elections and make your voice heard; if not you will soon find yourself enslaved by the most corrupt establishment. In order to achieve your noble aim, you must not forget the fact that “journalistic responsibility” is also on the decline and the spread of media ghettos are alarming. The dismantling of the old media has been accompanied by, and has probably helped cause, a decline in journalistic standards. These losses to society include journalists who’ll accept poor quality in pursuit of volume and repetition as well as the blurring and even erasure of boundaries between news and opinion, facts and non-facts, and journalism and entertainment. These losses feed polarisation. The main features of the old analogue media—including editing, fact-checking, professionalisation, and the privileging of institutions over individuals—served as a credentialing system for political expression. The distinguishing feature of the new digital media—the fact that anyone can publish anything that gains views and clicks—is replacing that old system with a non-system that is atomised and largely leaderless. One result made possible by this change is that Sri Lankans can now live in media ghettoes. More broadly, the new media resemble and reinforce the new politics, such that the most reliable way to succeed in either domain is to be the most noise-some, outrageous, and polarising. Given the crumbling trust in traditional media and our vulnerability to lies on social media, we should not be surprised that politicians on both sides try to manipulate voters into believing lies. After all, the incentive for politicians is to get elected, not tell the truth. To be elected, politicians need to convey the appearance of trustworthiness. If politicians can safely ignore fact checking by traditional news media and instead use social media to get their followers to believe their claims, the scale is tilted toward post-truth politics. In the long run, this tendency leads to high political polarisation and the deterioration of trust in the political system. In modern history, in states such as Russia, Spain, Portugal, and Italy, just to name a few, post-truth politics has led to the rise of authoritarian and corrupt regimes. We must do all we can to prevent this outcome in Sri Lanka. Research shows that without any intervention people tend to ignore information that goes against their beliefs, and are more likely to deceive both when they see others do so and when it is favourable to them. “When you’re dealing with frauds and liars, listen more to what they don’t say than what they do” DaShanne Stokes.